When walking or driving along the lakeshore of Toronto, Lake Ontario seems to spread out as far as the eye can see. Although it is the smallest of the Great Lakes, it has been enormously influential in our past and continues to impact our present. During the summer, we can often see boats coming into the harbor and pedestrians strolling along the lakeshore. Yet few people are aware of how integral the lake has been to the history of Toronto, beginning with its very formation. The Lake has been a source of food, a source of transportation and a source of conflict for millennia. For thousands of years, most of Ontario was covered in ice. The Great Lakes were created by the passage of these glaciers. When glaciers move, they can drastically alter the land around them, creating heaps of earth in front of them and trailing debris behind them. They also pick up and incorporate material from the ground as they pass, becoming giant blocks of gritty ice that scour all surfaces. As they melt, this load of large rocks, pebbles, sand, clay and silt drop out of the ice to cover the ground, creating a layer know as “glacial till” as well as leaving behind the natural landscape we see today. These glaciers also captured an enormous quantity of water in the form of ice. The volume of water was so significant that the earth’s crust sank beneath weight of the glaciers. After they melted, the earth began to rebound and continues to do so today, at a slow pace of a few centimeters every hundred years. As the ice age ended and the vast walls of ice retreated around 12, 500 years ago, the gouged out basins left behind began to fill with water, thus creating the Great Lakes. The Lakes deepened significantly as ice melted and they expanded their basins, becoming much larger than they appear today. Lake Ontario at this stage is known as “glacial Lake Iroquois”. Around 12,000 years ago, the waters receded significantly and initially fell back to sea level. Nearby landscape changes meant that water from the upper Great Lakes bypassed Lake Ontario entirely, heading directly to the St Laurence river via the Ottawa valley. This meant that for a few thousand years, the lake water levels were actually significantly lower than they are now. By 5,000 years ago, however, water was flowing though the lower Great Lakes again and Lake Ontario reached near its current level. This means that the earliest evidence of people in this area is now mostly underwater. Lakes were still being formed when the first peoples began to become established as a significant presence in the area. People have been living in the Great Lakes region for thousands of years. Lake Ontario, in particular, has been an important source of fish, as well as being a central point for transportation. Small groups of hunter-gatherers used the shore as a part of a major canoe route that extended laterally along the major river systems. The earliest physical evidence of human hunters in the Great Lakes region dates to approximately 11,000 years ago, soon after the glacier retreated. They were mainly small bands of nomadic hunters who were pursuing animals such as caribou, mastodon and mammoth. Although evidence is limited, we know that multiple groups often camped near the elevated shorelines of the Great Lakes (See Fig. 8). Unfortunately, many of these settlements now lie underwater, some more than a kilometer into the lake, since the water levels of Lake Ontario have changed significantly since then. These invaluable sites are fragile and non-renewable. They have suffered staggering losses during the past two centuries due to deforestation, cultivation and urban growth. This has caused hundreds of sites to be irrevocably destroyed, leaving behind an incomplete record and many unanswered questions. Lake Ontario was a center point for travelling. The north shoreline of Lake Ontario (aka Toronto) was a crucial junction for several important trade routes. The Lake has been vital means of transportation from the St. Lawrence to the interior of continent, as well as acting as a natural border between the north and the south. The rivers leading out of Lake Ontario (Credit, Rouge, Don Valley, and Humber) attracted people to the shores for fishing (mostly salmon) and linked inland communities to lakeside ones. The Rouge River and the Humber River in particular became important inland trading routes to the Holland River, Lake Simcoe, or the Georgian Bay. The waterways flowing from Lake Ontario acted as main thoroughfares, connecting many communities through a pattern of land trails. Portage points and river junctures were often important locations and became sites with popular trading posts, small towns and eventually forts. Traders would canoe as far as possible, and then continue on foot along these routes. The Toronto Carrying Place Trail (also known as the Toronto passage) was the main route, following the Humber River Valley northward to the west branch of the Holland River. This route connected populations throughout the Great Lakes area. Many of these trails have since evolved into modern roads, such as Davenport. The most striking shoreline feature on Lake Ontario itself was the southern peninsula (which later became Toronto Island). It helped create a sheltered harbor, and therefore a hospitable stopping place for those travelling by canoe along the hundreds of miles of coastlines along the north shore of Lake Ontario. Encampments and temporary villages were situated along river valleys and lakeshore for over ten millennia. Although there is no written record of their lives, their legacy exists in oral histories and traditions passed down through many generations, as well as through traces of the settlements that exist today. Lake Ontario acted as a boundary line between different groups of First Nation peoples. At the time of European contact, the resident peoples spoke several languages and dialects under three main linguistic groupings – Algonquian, Iroquoian, and Siouan. At the time, there were two main regions of the eastern woodlands inhabited by Iroquoian speaking peoples. Most lived in the northern region and were known as the Hurons, Neutrals, Wenros, Petuns, and Eries. The lands south and east of lake Ontario were the core homelands of five founding nations of the Haudenosaunee Confederacy, who later moved into the Toronto area during the 17th century. The Toronto Bay (or Toronto harbour) was an important location in terms defense during the late 18th century. The British authorities began to examine Toronto’s potential as a possible military settlement in the 1780s. By 1793, tensions were rising with the Americans and Simcoe was ordered to establish a new military post. Toronto was an excellent location from military perspective. It was removed from the immediate border region with the United States, deliberately distancing them from a nascent enemy. It was also enclosed within a sheltered harbor with only a single entrance, which protected them from sudden assault and could be easily defended against a naval attack. Currently, there are two channels into the harbor, at the east and west ends of the Toronto Islands. However, there was no eastern passage in 1793, because the “island” was actually a peninsula attached to the mainland. The harbor region was also strategic because it provided access to many inland locations. The roads could provide an alternative for transporting troops and supplies if the Americans took over the Lake, a looming threat as the war of 1812-14 approached. Lieutenant Governor Simcoe ordered the construction of Fort York in 1793. He wanted to establish a naval base in Toronto in order to maintain control of Lake Ontario. At the same time, he also moved the capital from Niagara to Toronto, and renamed the area “York”, a decision that was not popular with the local inhabitants. The name was ultimately reconfirmed as Toronto when the city was incorporated in 1834. In May of 1793, the Queen’s Rangers arrived and established the first military camp on the site of Fort York by the shore of Lake Ontario. Now, the Fort is actually hundreds of meters north of the shoreline due to efforts to fill the waterfront south of the fort between 1850s and 1920s but in 1793, the fort site was on the north shore of the harbour entrance. This brought a permanent military presence into the Lake Ontario region and effectively founded modern Toronto, as the army became the primary purchaser of goods and services in the area for many years and greatly impacted its economic development. Fort York was a focal point of action during war of 1812 (the Battle of York, April 1813). 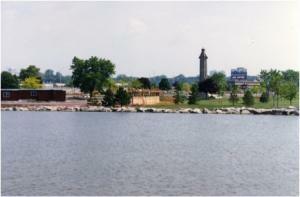 Ultimately, Simcoe failed to make York a strong, fortified naval base in Lake Ontario and Kingston eventually displaced it as the main headquarters. The harbourfront was also a site of controversy and tragedy, including the murder of Wabakinine, a Mississauga chief who had signed the Toronto purchase, the major treaty that involved the transfer of land ownership of the Toronto region to the British. In August 1796, Charles McCuen, a soldier in the Queen’s Rangers, murdered Wabakinine and his wife on the waterfront at York. This initiated a potentially explosive situation as the Mississaugas, already frustrated by the failed promises of the Toronto Purchase, considered a counter attack, either on the capital itself or on nearby pioneer farms. The colony tried to appease the situation by bringing soldier to trial for murder but due to multiple misunderstandings, witnesses stayed away from the trial and the soldier was ultimately acquitted due to lack of evidence. In the end, an uprising did not occur at this time. Joseph Brant, an interpreter, guide and important diplomat, worked to preserve relations and a cautious peace was eventually achieved. Lake Ontario has had many faces over the years. It has been a source of food, a meeting place and a travel location. It has been a source of conflict and a venue for creating friendships. It has seen battles, treaties, wars, bargains and betrayals. Lake Ontario has been an essential part of Toronto’s history and, for better or for worse, it has been integral to the formation of the city as we know it today. 2014 marks one hundred years of the extinction of the passenger pigeon. The wild pigeons, known as passenger pigeons, were once a thriving bird species.It is estimated that at the peak of their population, there were five billion passenger pigeons in Turtle Island, consisting of forty percent of the continent’s entire bird population. In the Winter they would live in the southern hardwood forests of the United States. In Spring they would migrate to Ontario in flocks so great they would reportedly block the sun and darken the sky. Upon their arrival, the mass flights would break up into separate flocks, and each flock would return to the same nesting places year after year. The diversified hardwood and evergreen forest bordering Mimico Creek was a preferred and busy nesting place for the birds because of its abundance of seeds, nuts, berries and roots. Sometimes a flock would occupy over a square kilometer within the forest. Every tree would have so many nests that their branches often broke under the weight of the multiple young birds. Sadly, such an iconic member of our ecosystem’s history is now hardly known today. The passenger pigeon species became extinct in a stunningly short period of time. As settlement progressed, so many birds were killed every season that their numbers became fewer year after year. The passenger pigeon had been a significant part of the Aboriginal peoples’ diet. Their bodies were smoked and dried to be preserved for Winter. Unfortunately, at the time of settlement, they began to be hunted in excess to feed the growing population. Just as lethal as their hunting was the destruction of forests, as the deforestation removed their nesting grounds. The birds were then attracted to the crops that replaced the forests, and were further killed in significant numbers when the crops were mowed. The recognition of their endangered state came too late and the efforts to save the species were unsuccessful. The passenger pigeon was officially announced extinct in 1914. 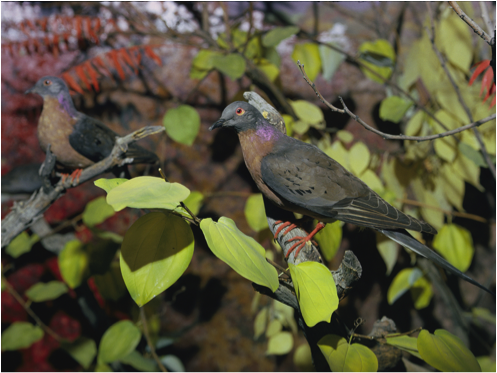 In Toronto, you can see a stuffed passenger pigeon at the Royal Ontario Museum. Verna Patronella Johnston (1909-1996) was an Ojibway author, mother, grandmother, and mentor, known for her work in helping Native youth adapt to urban life. She exhibited a strong presence in both her community of Cape Croker and the city of Toronto. When one of Verna’s granddaughters expressed interest in taking a secretarial course, Verna insisted she attend Shaw’s Business College in Toronto. The prospective student was interested in moving but was intimidated by the city, and being away from home. Verna decided to relocate to Toronto with two of her granddaughters and provided a comfortable and safe home for them within a small third floor apartment. The girls enrolled in business courses and had the support necessary to face new experiences with more ease. They knew of other Native students in boarding homes, who struggled with social acceptance by their boarding families, and so, felt disconnected within the city. But Verna’s granddaughters’ experiences were not free from difficulties. Verna insisted that the girls invite non-Native students to the house, as she believed that part of living in the city was to make positive relations. However, this effort was thwarted as the girls faced several rejected invitations. Eventually, three more of Verna’s granddaughters came to Toronto to attend school. The apartment wasn’t big enough so in 1966 Verna rented a large house in North Toronto, in a nice residential area close to public transportation. The home featured a big yard, cherry tree, raspberry bushes, and garden space. This was not the first time Verna had opened her home and heart to multiple youth. Before moving to Toronto with her granddaughters, she worked as a foster mother for many years. This new home on Blythwood Road was the first boarding house for Native students run by a Native person and Verna ran it for several years. By 1972, the boarding house moved to a new location on McGill Street, before it closed in 1973. During this period of her life in Toronto, Verna wrote and published a book, Tales of Nokomis, which features stories of teachings by Nokomis (Ojibway word, meaning grandmother) that were passed down orally to her in her own youth. After the boarding home closed, Verna moved back to her home in Cape Croker where she was approached by the community priest Father Lebel, who was concerned about the placement of children from the reserve into white homes by the Chidren’s Aid Society. 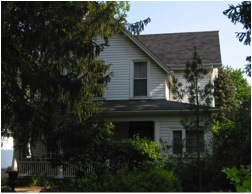 Verna and Father Lebel worked together to convert the old missionary house into a foster home that would be run by Verna. Acceptance by Children’s Aid officials was a challenge but a success, and CAS agreed to pay Verna to run the foster home. Tragically, the home was engulfed and destroyed by fire just a day before the children’s arrival, and Verna lost everything. However, she was resilient and soon after Verna managed to gain possession of a cottage and barn on a farm property. Within four months she renovated the cottage into a five bedroom home. Once again, Verna created a gathering place for youth, her grandchildren, foster children, and friends. Unfortunately Verna’s health declined, as she had been diagnosed with Hodgkin’s disease a few years prior, and her doctor advised her to slow down. She made the painful decision to stop fostering, and once again moved to Toronto. Once back in Toronto Verna was enraged to discover that white foster homes were paid double the amount she was given. Verna publicly protested against CAS; she wrote to newspapers, gave radio interviews, and made speeches in which she accused CAS of discrimination. Her work was effectual; it was reported soon after that foster parents on the reserve were now paid equally. Verna moved back to Cape Croker for retirement, but found this decision disappointing. She noticed the reserve had changed for the worse and had lost its sense of community. Even worse, she felt held back by friends and family who insisted she must relax and enjoy retirement. She felt restricted of the ability to speak her mind and be involved in the community. Restless, she went to Toronto once again to be respected and independent. She found her place as a housekeeper at Anduhyaun House, a hostel for women, and became a mentor for the residents. 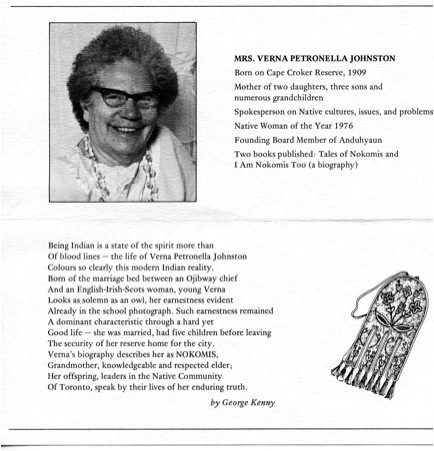 In 1976, Verna Patronella Johnston was awarded the title of Indian Woman of the Year by the Native Women’s Association. In 1976, her inspirational life story was written and presented in I am Nokomis, Too, by R.M. Vanderburgh. Read an Interview with Verna Johnston, April 5th, 1982. Teiaiagon (translation: “crosses the stream”) is a 17th century village built by the Five Nations Haudenosaunee (Iroquois). Located on the north shore of Lake Ontario, the area was previously occupied by the Huron-Wendat who left their territories and relocated at Wendake near Quebec City. It remains unclear as to exactly how the Huron-Wendat lost control of their traditional territory, which spans from Georgian Bay to Lake Simcoe, however, it has been suggested that they dispersed due to a combination of warfare, disease, and starvation brought on by inter-Indigenous and European conflict. After a period of warfare which spanned from the 1640s and 1650s, the Seneca tribe established Teiaiagon along the Humber River at some point in the 1660s. Teiaiagon is one of a string of villages, which include Ganatsekwyagon, that were strategically placed in order to control hunting territories and trade routes throughout Ontario. Specifically, the village is significant as it connects to Lake Simcoe via the Toronto Carrying Place portage and allowed villagers to oversee traffic along the river and port leading to Lake Ontario. By controlling this area, the Seneca could act as intermediaries and control the fur trade between the English, Dutch, and French who were active in what is now Southern Ontario, New York and Quebec. The name Teiaiagon and its variations (Taiaiako’n, Taiaiagon, Teyeyagon, and Toioiugon) appear on early French maps of Lac de Frontenac (now Lake Ontario) and the earliest written accounts of Teiaiagon are from European travelers. French missionary Louis Hennepin, is said to have stayed in the village for some time and lists Teiaiagon as having 50 longhouses and 5000 inhabitants. The village was built in Haudenosaunee style which includes longhouses within a fenced off area. Other reports mention the village being surrounded by agricultural fields where villagers harvested corn, beans, pumpkins, and tobacco. Occupation of the village lasted until 1687 and its abandonment remains unclear. This may be due to natural movements as Haudenosaunee villages are not meant to be permanent and the Seneca relocated to their traditional territories in New York. It is also possible that the village was left due to French military threat. By the time the Marquis de Denonville, Governor General of New France, had reached Teiaiagon the village was empty. Another theory, as argued in the Ojibwe oral tradition is that at the same time their tribes descended upon the Haudenosaunee in battle and emerged victorious.Although we do not have a definitive answer as to why the site was abandoned, by 1696 the Teiaiagon area was occupied by the Mississaugas, the Anishinaabe, and French. Trade flourished during the Great Peace of Montreal in 1701, the Mississauga had a village located on the west bank of the river and eventually the French built a fort called Baby Point in 1750. Overall the site was left relatively undisturbed until the development of the Baby Point subdivision in 1912. “Four hundred years ago, present day Baby Point was occupied by the Seneca Iroquois longhouse village of Teiaiagon (“crosses the stream”). The spirits of our native ancestors, including their bodies and the remains of their longhouse lifestyle were “returned to the earth” here. This is the land on which Robert Home Smith developed a beautiful early twentieth-century Eurocentric enclave. Much of the native settlement is still held in the earth there undisturbed except for the house foundations. In the spring of 2007, the ancient burial of a native woman was uncovered. This recovery was a stark remembrance of the origins of this place. Among the items discovered with her remains was the bone comb pictured here. For me, this comb conveys to us here now the sublime spiritual nature of this woman’s gifts. The Humber River, one of the two major rivers in Ontario, is 100km long and flows into Lake Ontario. Atop this body of water lies a bridge in a place that connects what use to be considered Toronto and Etobicoke, where the Humber flows out into the vast waters of Lake Ontario. Completed in 1994 the Humber Bay Arch Bridge is 139 meters long, with a width of 6.50 meters and cost a total of $4,050,000 to build. This bridge is also known as the Gateway Bridge/ Humber Bay Pedestrian Bridge as this is the best way to cross the city if not in a car. The project was a complied team of the clients, engineers, artists, and architects, and “it was a true collaboration of many different disciplines” (Brad Golden, one of the team members). One of the architects hired for the job was Montgomery and Sisam Architects Firm; and Delcan oversaw the structural engineering as well as the construction supervision of the project. Ahmoo (Allan) Angeconeb from Lac Seul First Nation was the First Nations art consultant for the project. Ahmoo is often a guest lecturer in First Nations art classes. He is also a consultant and has been a judge for the Ontario Arts Counsel regarding First Nations Art. His work is featured in the in collections at the McMicheal Canadian Collection, Museum Institute of Indian Art, Thunder Bay Art Gallery, University of Onsabruck, and the Woodland Indian Centre. www.maslakmcleod.com/painting/ahmoo-angeconeb.html. Although Ahmoo was consulted for the project, unfortunately there was not much First Nation input in the project and the architects on the project chose the designs (www.smashinglists.com). Everyone had a voice in the project, and it was not done by one individual person or firm. This is a reflection of First Nations culture as many times in many circumstances the whole community will have a chance to speak and give input, and the matter at hand cannot be dissolved until everyone agrees. The bridge is a beautiful piece of art that honors the First Nations influence in the area, as the bridge sits on top of a heavily travelled trading route used by First Nations for more than two hundred years (Mongomery and Sisam), and played a key role in Canada’s development and history. This route allowed First Nations people to gain access to Lake Simcoe and Georgian Bay (Montgomery and Sisam). The space was also shared with the French Settlers whom created a trading post near the mouth of the Humber River in 1720 (Museum of Archelogy). 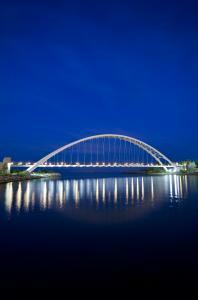 The top of the bridge displays the Thunderbird, an important symbol to First Nations people. The Thunderbird is the seer of all, being able to fly so high above all and it carries many significant traditional teachings. Under the bridge turtles, canoes, snakes and salmon are displayed, which act to commemorate the First Nations influence on the area, as well as the natural species that used to inhabit this space, but have since left due to pollution. It is a reminder that with the rise of the concrete world we need to remember and respect what used to be here, and treat it in a way that will enable these creatures to return and stay. The Arch Bridge has won many awards including the Governor General’s Award of Merit 1997, City of Toronto’s Urban Design Award of Excellence 1997, Award of Excellence from the City of Etobicoke 1996, The Canadian Institute of Steel Design 1996, Canadian Architect 1995 (www.the-site.com/humber.htm). 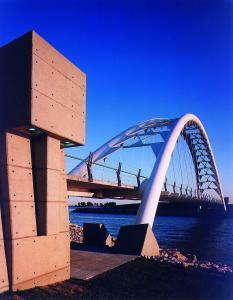 The Bridge also won the Waterfront Centre Honor Design Award 1997, and lastly, City of Toronto Urban Design Award in 1997 (Ferris and Associates Firm). On top of accomplishing all of these awards, the Arch Bridge is featured on the 15 most amazing and beautiful bridges list (international) coming in at number 14. 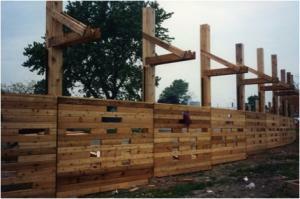 The photos below are of the fence that was around the construction site of the bridge. The team felt that since the fence would be up for at least seven years while the bridge was being completed it would make sense for the surrounding enclosure to relate to what would soon emerge. The design that was chosen for the fence embodies that of a Wampum Belt. In First Nations culture, specifically Haudenosaunee, the Wampum Belt symbolizes a contract between two groups, in most cases the Haudenosaunee and the European settlers. It is a treaty and bond that promises to respect one another and not interfere with each other’s ways. 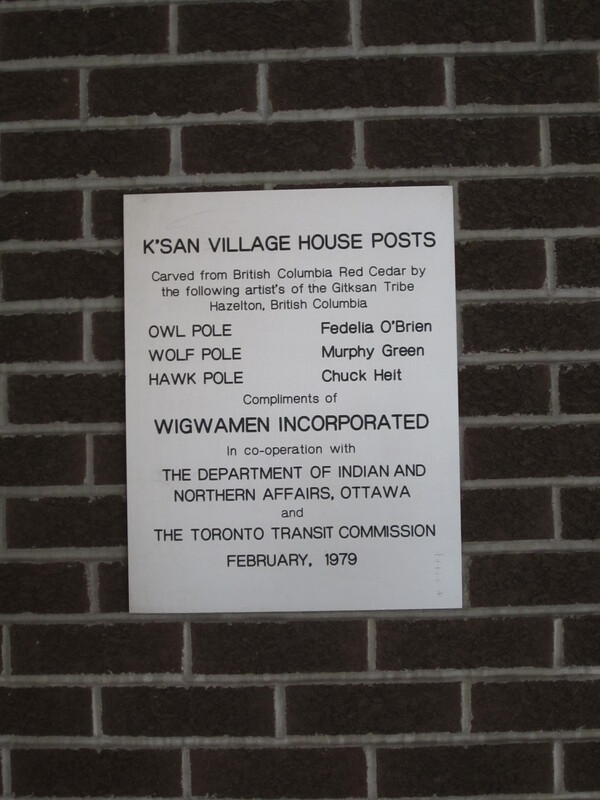 In the 1975 the Native Canadian Centre of Toronto raised enough funds to purchase a new larger building to house the growing initiatives of the centre and the Aboriginal community in Toronto. The new location purchased was 10-16 Spadina road, which was previously known as the Ontario Bible College. This area was to house the Native Centre, a 120-unit senior citizens apartment (Wigwamen Housing Corp.) and as a result of a request from the Library Committee at the Native Canadian Centre, a Native library and reference centre. 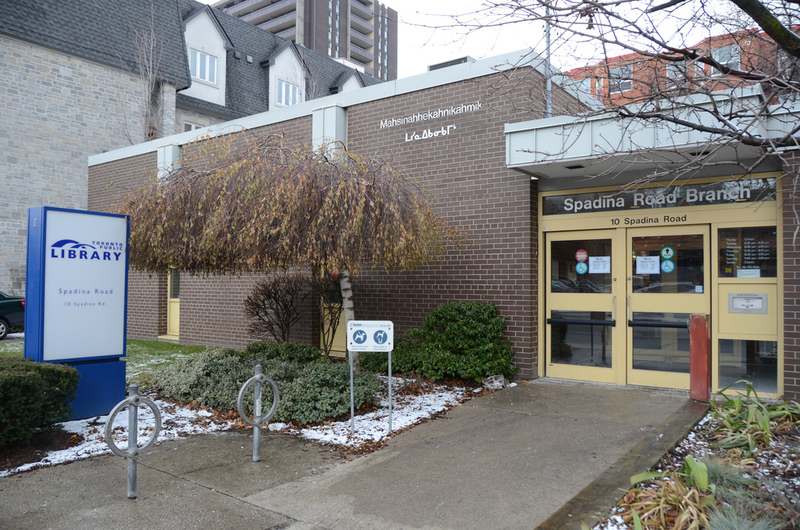 The Native Canadian Centre had its grand opening in 1976, and by 1980, the Centre was successful in retiring its mortgage when 10 Spadina, the Native library and reference centre, was sold to the Toronto Public Library. Many studies done at the time proved the need for a library and reference centre in the Native community. The Spadina branch of the library set out to hold a special collection for the Native community in Toronto. To this day, the branch continues to house one of the most extensive Native Collections in the city of Toronto. The library also has the name written in Cree syllabics and roman orthography on the front of the building, Mahsinahhekahnikahmik, meaning “the lodge or place of the book”. Oronhytekha (Burning Cloud), baptized Peter Martin, was born into a Mohawk family on the Grand River. He attended a residential school for children of Six Nations where he was trained as a cobbler and perfected his English. At the age of 14, a phrenologist traveling through the reserve deemed Oronhytekha educable. He then convinced his parents and the Church of England’s agent to let him accompany the phrenologist out of the community to Wilbraham, Massachusetts to attended the Wesleyan Academy where he graduated from a missionary studies program in 1856. He then continued his religious studies at Kenyon College in Gambier, Ohio where he completed a four-year degree in three years graduating at the top of his class in 1860. After completing college and returning home, Oronhytekha was chosen by the chiefs of Six Nations Council to give a welcoming address to the Prince of Wales upon his visit in 1860. The prince was so impressed with his presentation that he invited Oronhytekha to study at the University of Oxford in England. Later in that year, he traveled to England to begin his studies at Oxford, and was only able to complete one semester, as he had not obtained permission from the Church of England’s agent to leave the reserve and was forced to return. 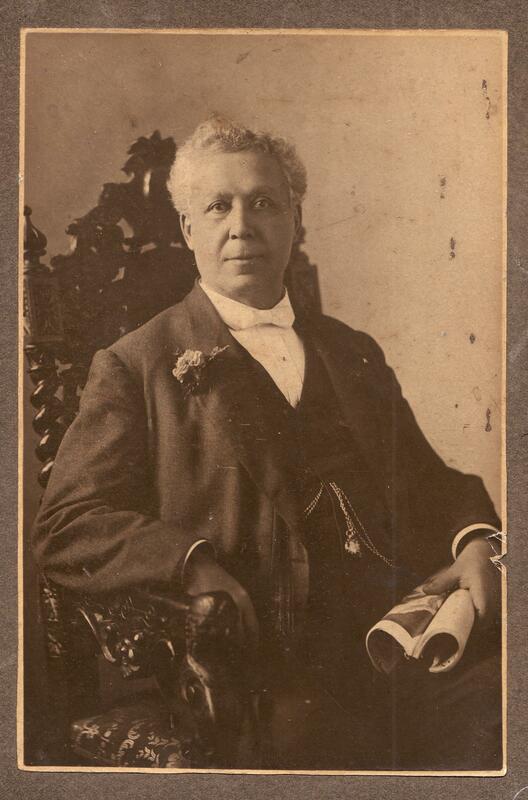 He continued his studies at the University of Toronto and received his medical degree in 1867, being one of the first Aboriginal people to graduate as a medical doctor. In 1867, Dr. O settled in Frankford, ON close to the Tyendinega Reserve where he maintained a thriving medical practise advertising the use of “Indian cures and herbal medicine. Soon Sir John A. MacDonald recommended his appointment as consulting physician for the Mohawks at Tyendinaga, Dr. O took the position and moved to Napanee. There he built a large house for his family, but his salary of five hundred dollars a year could not keep his lifestyle afloat. In an attempt to generate more income, Oronhytekha purchased a half interest in a general store. He was soon bankrupt as a result of extending credit too abundantly. He then mortgaged all of his property and moved to London Ontario where he began a new practice in 1874. While in London, Dr. O established many connections by promoting that he was an Oxford trained physician and former government official. There he joined various temperance, fraternal and masonic orders including the Orange Order. Through these connections he joined the American based fraternal order of the Independent Order of Foresters (IOF). Their constitution stated that it was open to ‘white males’ only, but because of the status that Oronhytekha had obtained amongst the Orange Men, the IOF granted him admission. At that time the IOF was struggling with dwindling membership rates and massive debts. Oronhytekha managed to gather enough members, from the lodges that remained in Ontario at that time, in Ottawa to reconstitute the IOF in 1881. He was then elected the IOF’s first Supreme Chief Ranger. Throughout Oronhytekha’s time as Supreme Chief Ranger he extended insurance benefits, previously accessible only to the wealthy, to the general population at a practical rate. He was successful at leading the organization to accept women as full members in 1891, and later expanded benefits to the children of deceased members. The IOF had a member base of 369 people and a debt of $4000 when Oronhytekha took up his new position. By 1907, at the time of his death, the IOF’s membership had grown to over a quarter of a million people across the world, as well as an impressive $11 million in liquid assets. As the IOF grew, Oronhyatekha recognized a need for an equally fitting and representative building to house the head office in Toronto. 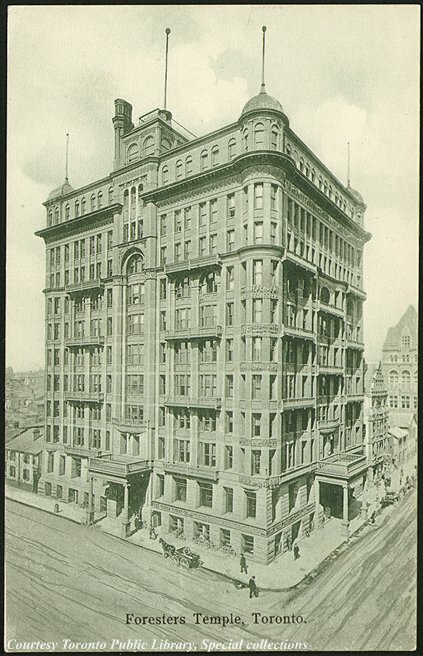 One of Toronto’s first skyscrapers, a 10 story high state-of-the-art building, dubbed the Temple Building was erected from 1895-97 on the corner of Bay and Richmond Streets. A life size bronze statue of Oronhyatekha was commissioned to memorialize the opening of the building and the efforts of Oronhytekha. The statue is still located the lobby of the current head office of the IOF on Don Mills Road Today. Oronhytekha’s position as chief ranger for the IOF had required him to spend a significant amount of time traveling the world to begin new lodges and increase membership. Throughout his travels Dr. O accumulated a collection of over 800 artifacts. With enough artifacts to establish a small museum, the Oronhytekha Historical Rooms displayed the collection at IOF headquarters in the Temple Building. In 1911, the IOF donated Oronhytekha’s historical collection to the Royal Ontario Museum where the artifacts were divided into smaller collections based on their region or origin. Much of his collection included Indigenous artifacts and items related to the connection between Indigenous people and the Crown. When Oronhyatekha passed away in 1907, his body lay in state at Massey Hall in Toronto for the public to pay tribute. 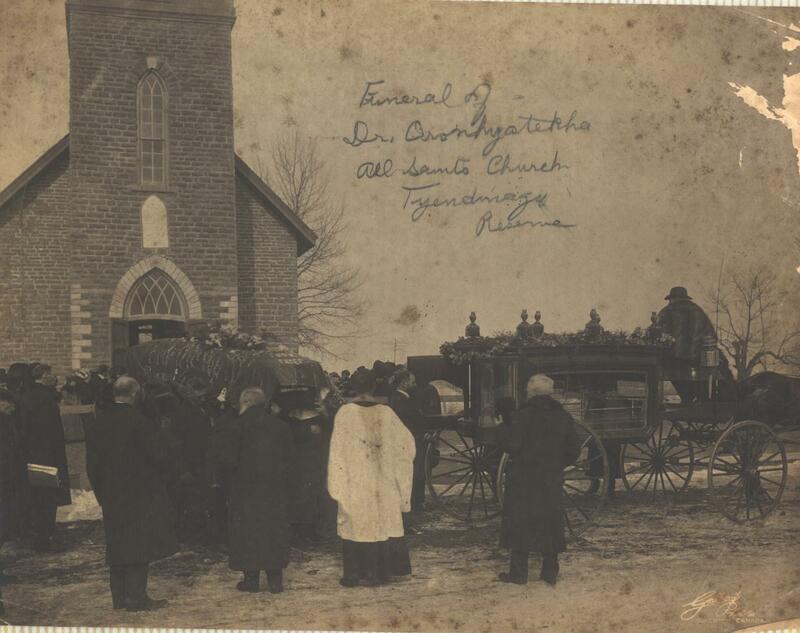 On March 6, over 10,000 people came to pay their respects to Dr. Oronhyatekha and the next day a train was specially commissioned, to carry his body to Tyendinaga Reserve for a family service. Oronhyatekha achieved great success in Victorian society, and has many more accomplishments to show for it. 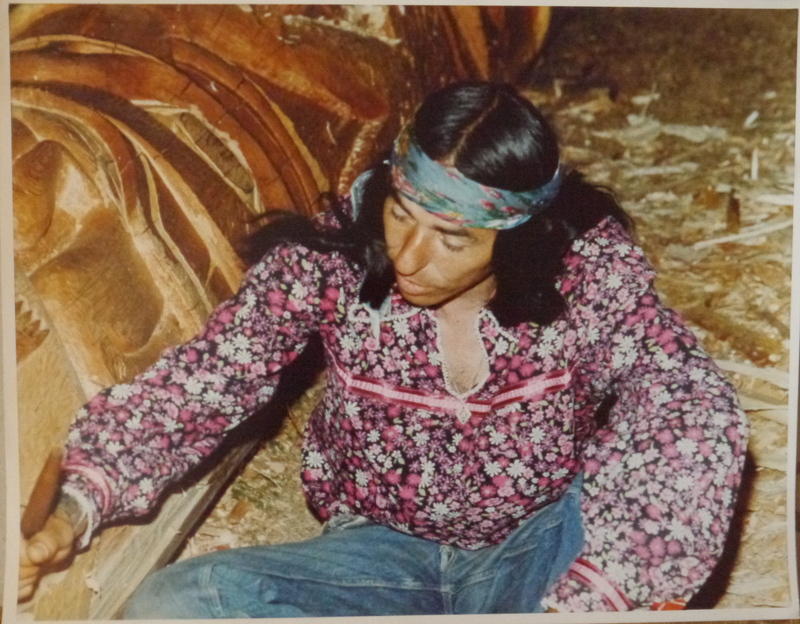 He did all of this while maintaining strong ties to his Mohawk heritage and culture, leaving behind a legacy within the IOF, and a small museum worth of artifacts that were representative of the man who traveled around building this collection. A plaque in memory of Dr. O is located in Allen Gardens Park. “The Good Works of Dr Oronhyatekha.” Medical Post 32.2 (1996): 41-. CBCA Complete; CBCA Reference & Current Events; ProQuest Business Collection; ProQuest Research Library. Web. 23 Oct. 2012. Comeau-Vasilopoulos, Gayle M. “Oronhytekha.” Dictionary of Canadian Biography Online. 1901-1910 (Volume XIII). Web. 4 Oct. 2012. Jamieson, Keith A. “Oronhyatekha: in the 19th century, he was a prominent MD and CEO who held sway with cabinet ministers and belonged to secret societies …” Rotunda Fall 2000: 32-7. Canadian Periodicals Index Quarterly. Web. 4 Oct. 2012. 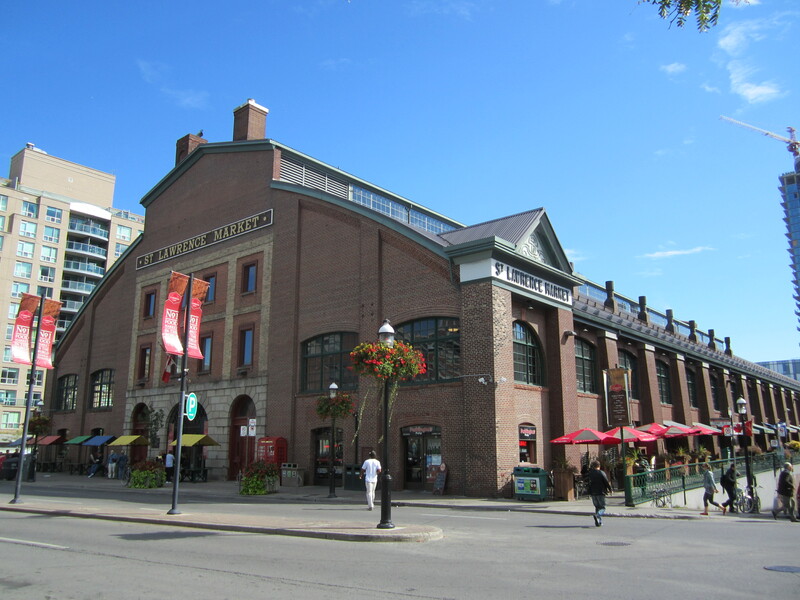 St. Laurence Market and the story of Chief Wabakinine. 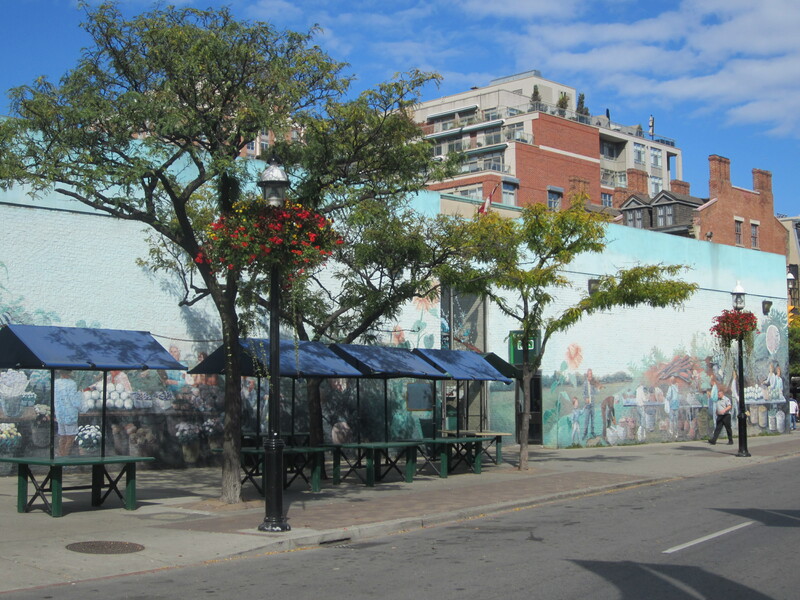 The St. Laurence market area has been a place where Aboriginal people have traded with Europeans for many years before the official market block. The first permanent structure was established here in 1803 by Lieutenant Governor Peter Hunter; it was constructed of wood and was built at the North end of the market block, between King and Front Streets. It is in this area where an important but unfortunate event began. Wabakinine was a warrior and chief of the Mississaugas of New Credit First Nation, as well as an important signatory on several land surrenders including the Toronto Purchase in 1787. Author and Professor Donald Smith notes that the “most important story in his life was his death” which eliminates the popular notion that the connections between Aboriginal people and Europeans were amicable. In August of 1797 Chief Wabakinine, his wife and his sister traveled from the Credit River to York, where St. Laurence Market now stands, to sell salmon. 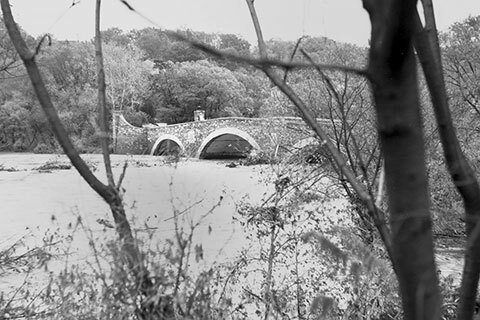 According to accounts from early settlers in the area, the Credit River was once so full of atlantic salmon that people were able to cross the river by walking on their backs. By the end of the 1800s the salmon were gone due to damming, overfishing and water pollution. They did not return for over 100 years. In the 1960s Chinook and Coho salmon from the pacific were imported to Lake Ontario. After the chief, his wife and sister sold their salmon, they went to Berry’s Tavern. That day the Wabakaninie’s sister was approached by a soldier by the name of Charles McCuen. He propositioned her to grant him ‘certain favors’ in exchange for a dollar and some rum. That night, Wabakinine and his family camped under their canoes’ on the waterfront near Berry’s Tavern in York. Wabakinine’s wife woke up to McCuen and some accomplices infiltrating their camp and grabbing the chief’s sister from under her canoe. She woke her husband, concerned that they were going to kill his sister and he stumbled out from under his canoe. A scuffle took place and Wabakinine was repeatedly struck with a rock and left unconscious. his attackers then violently attacked Wabakaninie’s wife. Other members of his band were camped out nearby on the peninsula (the strip of land that then connected the Toronto Islands with the main land of Toronto), and they heard Wabakinine’s wife’s cries and hurried to their camp. When the other members of the band arrived, McCuen and his accomplices had already left. Wabakinine was carried back to the peninsula and the band left for the Credit River early the next day. Sadly, the Chief passed away during their travel home. Wabakinine’s wife passed away shortly after him due to the injuries she sustained during the incident. She was the sister of another influential Chief, and when the Mississaugas who were away hunting found out about her death, they demanded retribution. This led to them stopping a provincial surveyor from continuing his work in the Grand River area. These murders came at an unfortunate time for Upper Canada authorities who were anticipating an attack from French and Spanish forces. With a Native uprising looming, there was much fear and speculation that Joseph Brant of Six Nations would lead the Natives in an attack. It was thanks to Joseph Brant that the attack did not occur, for when he was approached by the Mississaugas to join them in attacking the British garrison at York and Newark, he advised them against it. McCuen was put on trail, but, as is usual in these cases, was released due to a lack of evidence. 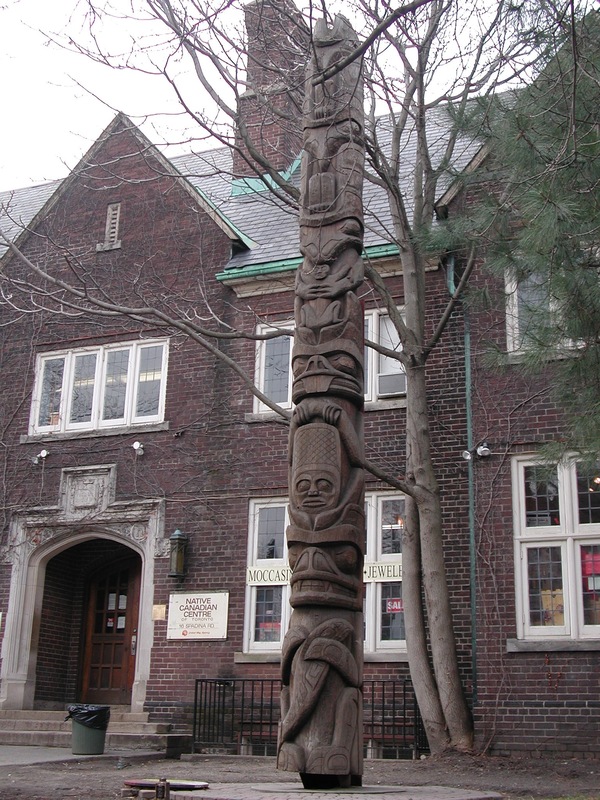 Much more than an identifying symbol, the Native Canadian Centre’s totem pole represents the strength, pride and power of the urban Native Community in Toronto. 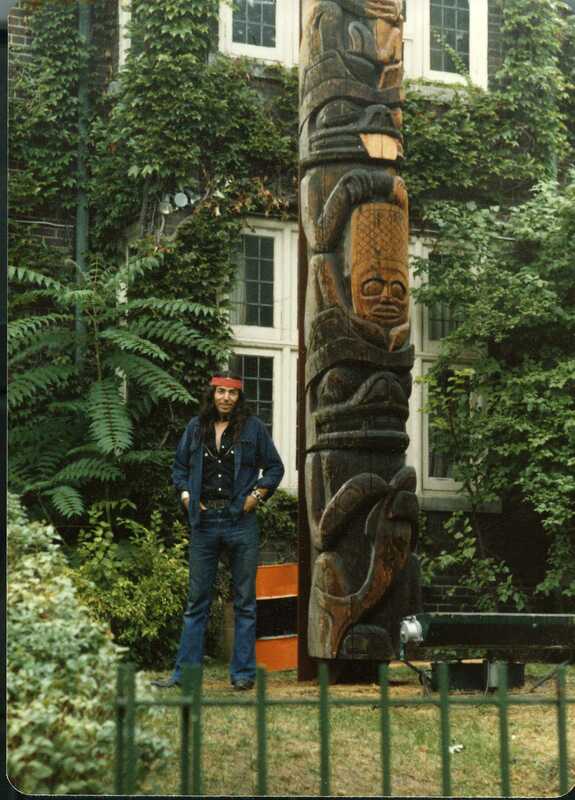 The 12m high totem pole was donated in 1980 by artist Don McLeay, born in Saskatchewan in 1940, of Plains Cree origin. On September 13, 1980 a pole rising ceremony was conducted on the front lawn of the NCCT. 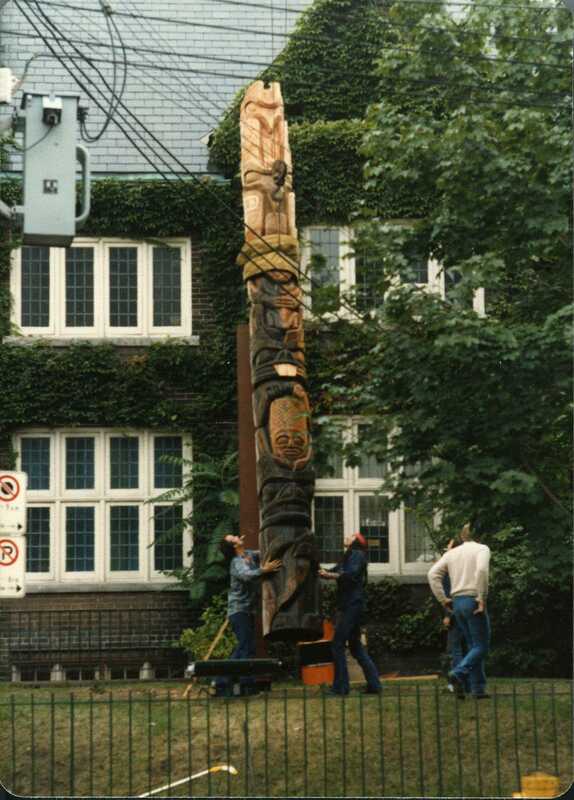 Using several tones of Red Cedar, the pole was designed with the use of clan systems from this part of the country to represent the coming together of people from different nations at the NCCT. 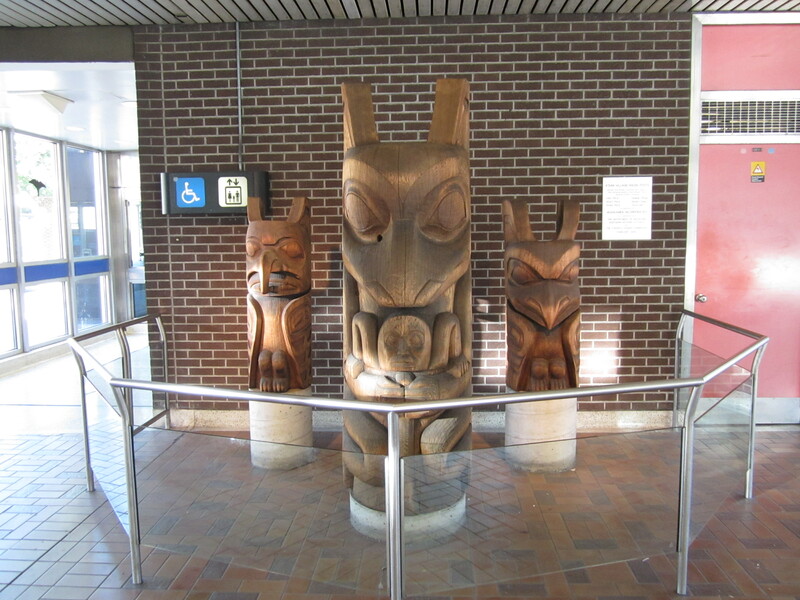 Some totems presented are a bear with a salmon in its paws, a wolf with a human in its paws, raven, thunderbird, weasel, turtle, and a frog.